Most people haven’t had a chance to taste the honest flavor of butterscotch before. 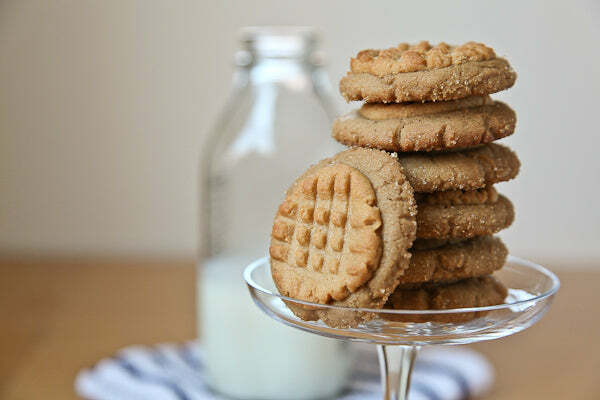 A combination of brown butter and brown sugar, butterscotch is one of those old fashioned flavors that have fallen to the wayside, with most people associating the flavor with those sunflower yellow hard candies or the sandy brown artificially butterscotch chips you can find in the grocery store aisles. The truth is real butterscotch flavor is rich and deep and immediately reminiscent of time when you could go to sleep without locking your doors and all your neighbors had white picket fences. The first bite will make you swoon with love. 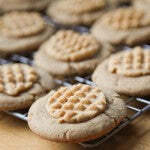 As you bite into the cookie, the first flavor that hits you is the Smooth Operator peanut butter, rich with nutty goodness. Then the butterscotch flavor comes next, buttery with touches of caramel underneath. 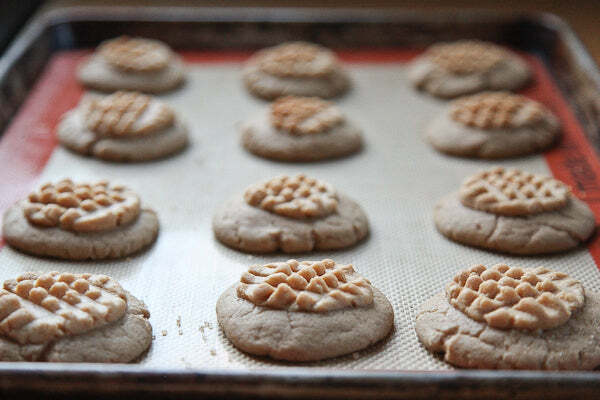 Finally the sweet crunch of the turbinado sugar on the bottom finishes the bite in a way that can only be described as “excellent” by my peanut butter loving friends. One warning about these cookies: once you make them, they are incredibly addictive. You have been forewarned. 2. 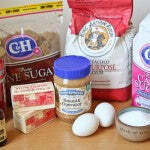 Make the butterscotch dough by placing the flour, salt, baking soda and baking powder in a large mixing bowl. Take a balloon whisk and vigorously stir the dry ingredients together until completely blended. 3. Place 10 tablespoons (1 1/4 sticks) of butter in a large pan. Turn the heat to medium and melt the butter. Then cook the butter until the fat solids of the butter starts to just turn brown (the butter will foam up in the beginning but subside after awhile – if it hasn’t turn the heat down to a lower power). Turn off the heat and continue to swirl the butter in the pan until the residual heat of the pan turns the fat solids golden brown and the butter becomes fragrantly nutty. 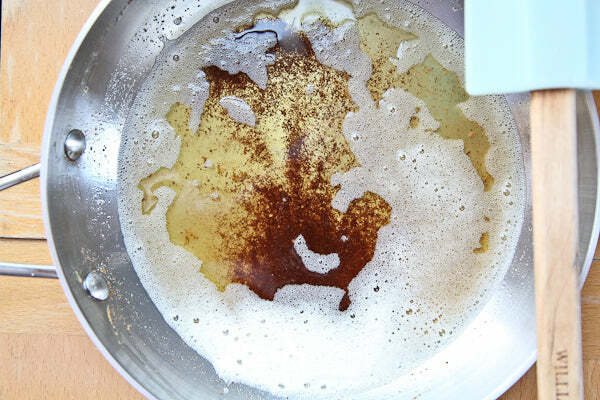 Pour the brown butter into the bowl of a standing mixer fitted with a paddle attachment. Add the additional 2 tablespoons of solid butter and beat until the butter melts and has cooled a bit (about two minutes). 4. 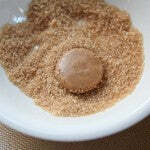 Add the brown sugar and beat for 30 seconds to blend. Add one egg and beat until incorporated (about 30 seconds). 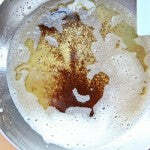 Repeat by adding the additional egg and vanilla extract and beating until incorporated. Add 1/3 of the dry ingredients to the wet ingredients, beating to incorporate. Repeat two more times, until all the dry ingredients are incorporated. The dough should be stiff. 5. 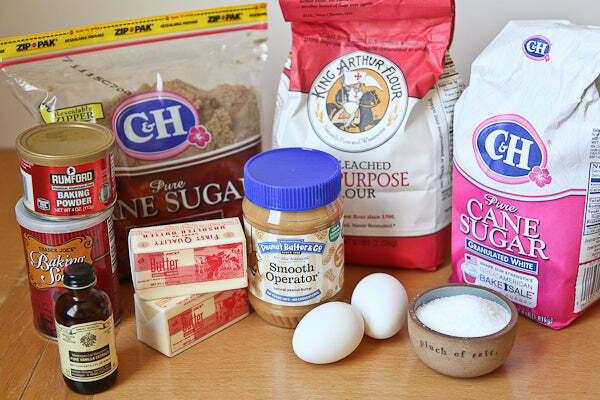 Move the butterscotch dough to a different mixing bowl (don’t bother cleaning the mixing bowl or paddle attachment after making the butter) and make the peanut butter dough. First place the flour, baking soda, baking powder and salt in a clean mixing bowl. With a balloon whisk, vigorously stir the dry ingredients until completely blended. 6. Place the butter and sugars in the unclean bowl of the standing mixer. Cream the butter on medium speed until it is light and fluffy, about 2 minutes. Add the Smooth Operator peanut butter and beat until incorporated, about 30 seconds. Add the egg yolk and beat until incorporated, about 15 seconds. Add the dry ingredients all at once and beat until incorporated, about 1 minute. 7. 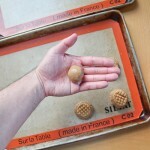 Pinch off a rounded tablespoon of the butterscotch dough and roll it in the center palm of your hand until it is a ball. 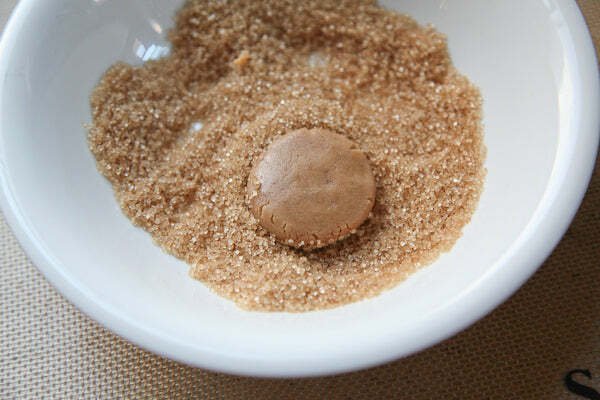 Then press your palms together with the ball in the middle to form a butterscotch cookie disk. Then dip one side of the disk into the turbinado sugar, lightly pressing down to affix the sugar to the bottom of the dough. Place the disk on the lined baking sheet with the sugar side down. 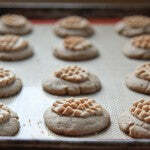 Repeat, filling the baking sheet with the butterscotch dough, spacing the cookies 2 inches apart. 8. 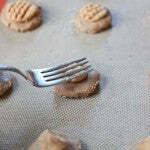 Pinch off a rounded teaspoon of the peanut butter dough and roll in the center of your palm until it’s a ball. 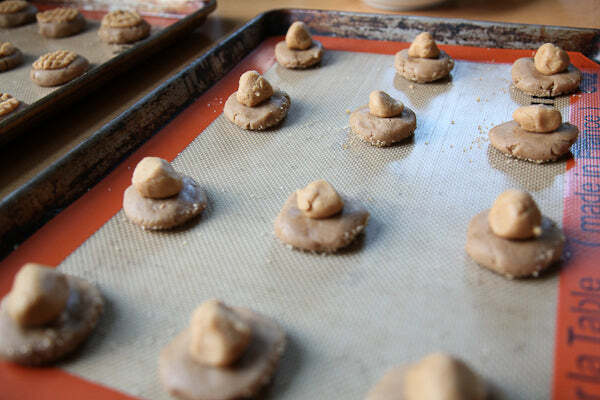 Place the ball in the center of a butterscotch dough disk on the baking sheet, and press lightly down on the ball so it flattens onto the butterscotch disk. 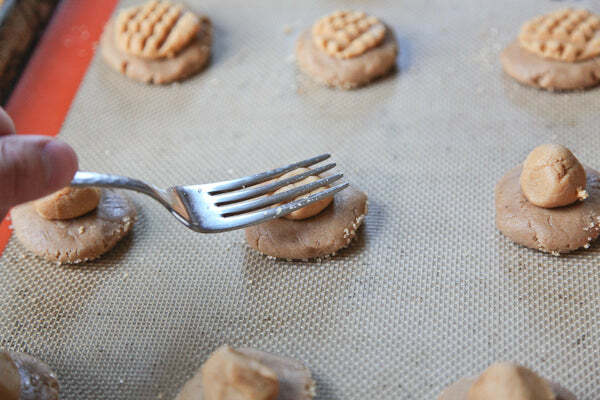 Take a fork and press lightly on the peanut butter dough, so it makes an indention, then turn the fork 90˚ and press down again, forming a criss cross pattern on the peanut butter dough only. 9. 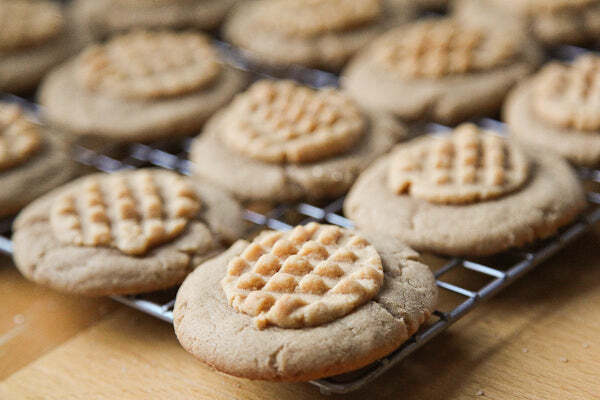 Repeat for all the cookies and bake in the preheated oven for about 11-13 minutes or until the edges of the cookies start to look dry and turn golden brown, try not to overbake them as you want the butterscotch cookies to be chewy. 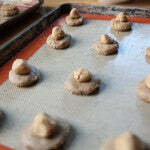 Let cool on the baking sheets for 5 minutes before moving them to a wire rack to cool completely. 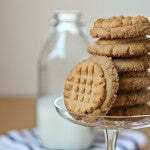 The post Smooth Operator Peanut Butter Butterscotch Cookies appeared first on - Peanut Butter & Co. Recipe Blog.